Orson Welles knew Falstaff. That is to say, as well as any twentieth century man could know a six-centuries-earlier construct character of William Shakespeare. Both men, by this time in their lives, had heard the deathly sounds of the chimes at midnight. Yet both persisted valiantly. For Welles, the struggle netted him the film, Chimes at Midnight. Until now, despite its towering reputation, Chimes at Midnight has remained nearly inaccessible. Those fortunate enough to have seen it prior to this extensive restoration (which ran theatrically in New York City and elsewhere in January of 2016) likely had to endure a horrid print with even worse sound. Falstaff, the sometimes buffoonish, sometimes noble rotund knight of Henry IV Parts I and II, as well as The Merry Wives of Windsor, takes center stage in this Welles 1966 release. As evidenced in this newly released definitive version, the character's name served as the one-time title of the film. Amid the opening credits, it reads "Falstaff: Chimes at Midnight". Like the character himself, the film communicates an effective blend of sardonic wit, unexplainable energy, and untempered hopelessness. The ways in which Welles could identify with Falstaff has been speculated upon and written about several times in consideration of the great filmmaker's career. In Shakespeare, Falstaff famously nurtured Prince Hal, the future King Henry V, before ultimately being exiled by him. (Spoiler alert) Welles, in comparison, made the greatest film of all time, and lived to pay the price for it, from that point on. He was fostered by Hollywood before being rebuked by it. Heavy is the head that wears the crown. Very, very heavy. 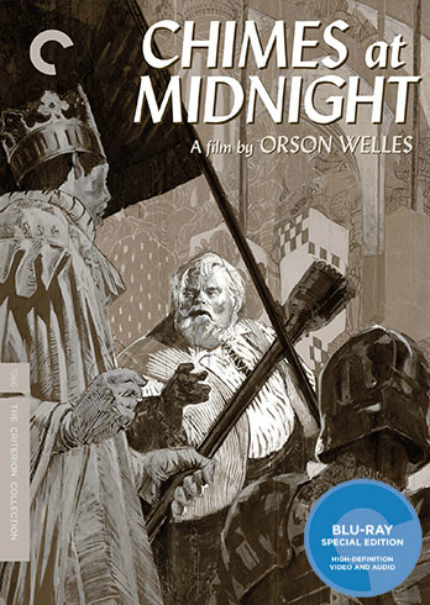 Chimes at Midnight is a taut and unique achievement, bounding from a screenplay carefully and cagily cobbled together from five separate but related Shakespearian plays. Likewise, Welles' editing here is downright pioneering. At every phase, it has a formal snap-crackle-pop that keeps things constantly fresh, never at all soggy. The world Welles has built on a shoestring is tremendously admirable. One of the several experts on the numerous bonus features tells about how he personally had a say in every single costume on screen. Long beams and cross beans with support beams, all made of solid, aged wood, are so ubiquitous and tactile as the scenery, one can almost feel the splinters. Chimes at Midnight is indicative of later Welles-ian rascaliness: handheld camera, wild framing, and a sometimes flagrant disregard for conventional cinema aesthetic. Yet, it may be the pinnacle of his trademark immaculate looseness. Produced by hook or crook in a downward point in Welles' studio viability as a director, (although the studios were all too happy to have him as an actor; the earnings from such gigs would go towards productions such as this one,) the film's tactile period detailing and utter sense of care can only go so far to hide the low-budget seams of its making. The sound, all recorded after the fact, is notoriously bad, but on the flip side, the black and white cinematography exudes every bit of the deep focus and lucidity of Citizen Kane. Not all of the film's synch problems are solved with this release, but we're told that they've been mended in big ways that would make Welles proud. This was, after all, the movie he made which he was most proud of. Some but not all of the acting is often clownish and hammy, no doubt by careful design. Yet, for this viewer (unfamiliar with Falstaff and the plays he sprung from, but knowledgable of Welles) it proves exhausting. Not all such exhaustion is negative, but this aspect of Chimes did prove to be a bit of a barrier. Certain characters, that is, the handful of "comedy characters," are manifest as stagey, even shrieky in their flamboyance. While this decision isn't necessarily wrong, this reviewer found the occasional surplus of loopy loons a detractor to the otherwise brilliance of the film. It's clear that Welles built his film with performances as the foundational bedrock. The great ones (Welles, John Gielgud as King Henry IV, Keith Baxter as Prince Hal, and Jeanne Moreau as Doll Tearsheet) are electric, the kooky ones are inescapable. Welles himself, front and center in the starting role of Falstaff, is positively, mischievously giddy about his part. The chance to saunter about in a disheveled cottony beard and a comical load of extra girth on top of his actual notorious frame appears to be the driving motivation of doing this film in the first place. The experts on the blu-ray's many contextualizing bonus features share that this is far from the first time director's played the part, the previous times being on stage. The film's mighty centerpiece, a medieval showcase of all-out warfare, is a showstopper for the ages. 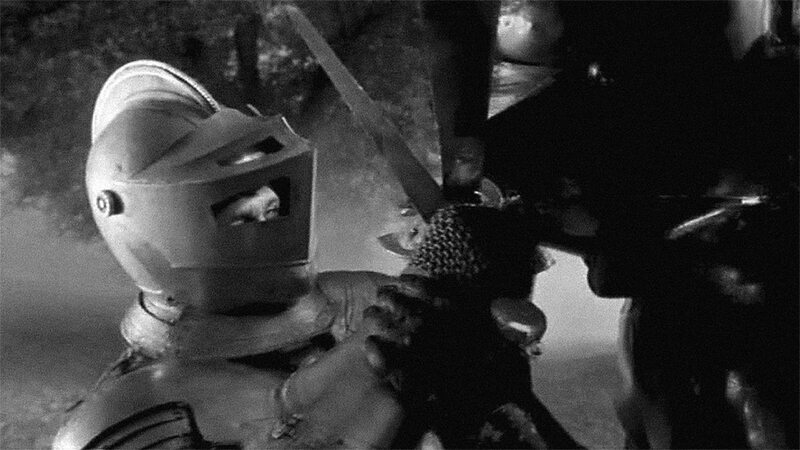 Crafted in cinematic chronology in between Eisenstein's Alexander Nevsky (1938) and Mel Gibson's Braveheart (1995), Chimes at Midnight's grand showdown might just be the most intense, most well-constructed showdown of long spears, archery, swords and horse-mounted battle of the bunch. It is exquisite in its mounting brutality, utilizing fog to not only hide the fact that there aren't all that many extras in the scene (apparently the whole thing was accomplished with fewer than 200 men), but to play up the sheer democratizing of such chaotic combat. Once the two sides have collided and everyone is fighting for their lives, one guy in armor looks an awful lot like any other, regardless of allegiance. Cover them with mud, and the effect only intensifies. Welles plays it to a fantastically proper horrific finish, looping back around for a personal showdown between two characters we know and care about. As spectacularly as it all hold up today, one can only imagine how breathtaking it had to be for 1966 audiences. For all of that, I myself have yet to embrace this film as opposed to admire it. It's no sin to not love such a film as this, even as one recognizes its accomplishments. And make no mistakes, the indie-spirit, artistic and practical accomplishments of Chimes are bold, numerous, and worthy of the praise it's received. Yet, there is this personal connection... Those of us who suffer from delusions of grandeur yet perpetually find ourselves stuck in the mud will relate greatly the Welles in this place, in this phase. For him, the mud is everywhere, but this time he's transcended it in a playfully classy way that only he could manage. Criterion has, quite rightfully, spared no effort in making this long, long-in-coming release of Chimes something extra special. All your favorite living Welles authorities are probably here, including his devoted biographer Simon Callow and film historian Joseph McBride. Film scholar James Naremore delivers a newly recorded audio commentary, a particularly insightful extra. Yet another film scholar, Michael Anderegg, provides the essay insert. Additionally, there are substantial video interviews with surviving cast members Kieth Baxter and Beatrice Welles, the filmmaker's daughter who appeared in the film (and was made to play a boy) at a young age. All of the video interviews run at least twenty minutes, if not longer. Finally, besides the film's new trailer, Criterion has included a vintage Merv Griffin Show clip featuring an interview with Welles that was recorded in the editing room while he was putting Chimes together. It's a fun inclusion. Celebrated upon its release, then promptly removed from the world due to rights disputes, it's a wonder to finally experience Chimes at Midnight, perhaps better than it's ever been experienced prior. For the first time, the chimes signal new life. Criterion's Blu-ray of Chimes at Midnight releases August 30, 2016. The images used in this review are intended only to represent the film itself, and are not meant to be indicative of the Blu-ray's image quality.